Sandown was another very busy weekend for McElrea Racing with us running seven cars in two categories. 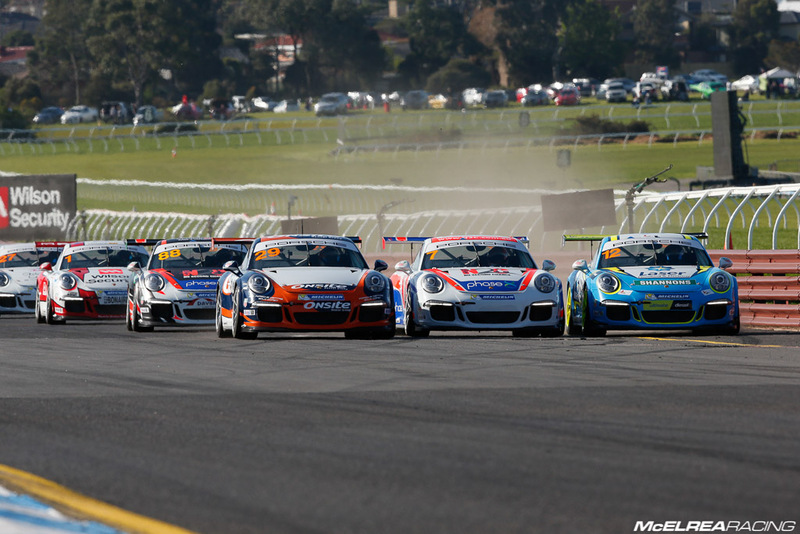 Five in Carrera Cup and two in Australian GT. The Awesome MR Crew had been absolutely flat-out in the lead-up to the weekend as not only did we need to get all seven cars ready but we also had to prep another five cars which we are running in the final round of the GT3 Cup Challenge at Phillip Island this weekend. Needless to say the guys have put in a monster effort..!! The weekend will remembered by many for the monumental crash in the first corner of race 2 that left one of the cars without an engine. This meant that due to TV broadcast time constraints the second Carrera Cup race was cancelled. Luffy had a very busy weekend doing double duty co-driving with Garth Tander at HRT. 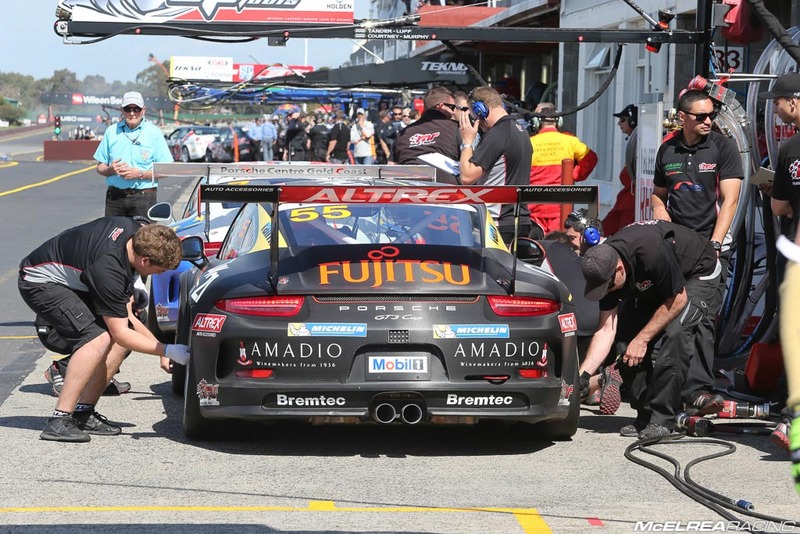 Whilst he finished an impressive 3rd in the V8s he had a tough weekend in the Porsche. After qualifying on pole and setting a new qualifying record an average start in race 1 dropped Luffy to 4th after lap 1 and he finished 5th. Race 2 was a DNF for the whole field due to the massive accident which tore the engine out of Nick McBride’s car at turn 1, which led to a red flag ending the race. In race 3 Luffy started and finished 5th, which was a fair way off our expectations after his qualifying pace. Warren Luff set the fastest time in qualifying but struggled with race pace. 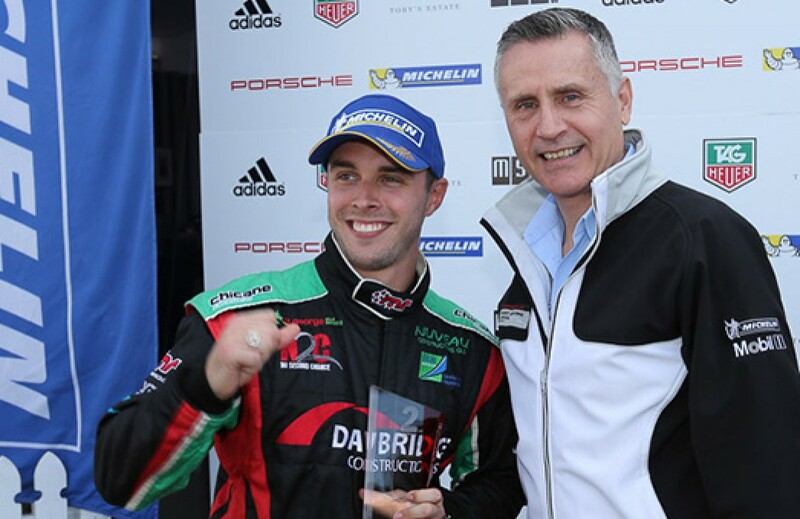 Showcasing the extraordinary competitiveness of the 2014 Carrera Cup Season, Shae qualified in 4th with a time only one tenth of a second behind Luffy on pole. This is less time than it takes to blink..!! He made his trademark blinder starts in all 3 races culminating in a fighting 3rd place in race 1 and a superb 2nd place in race 3. 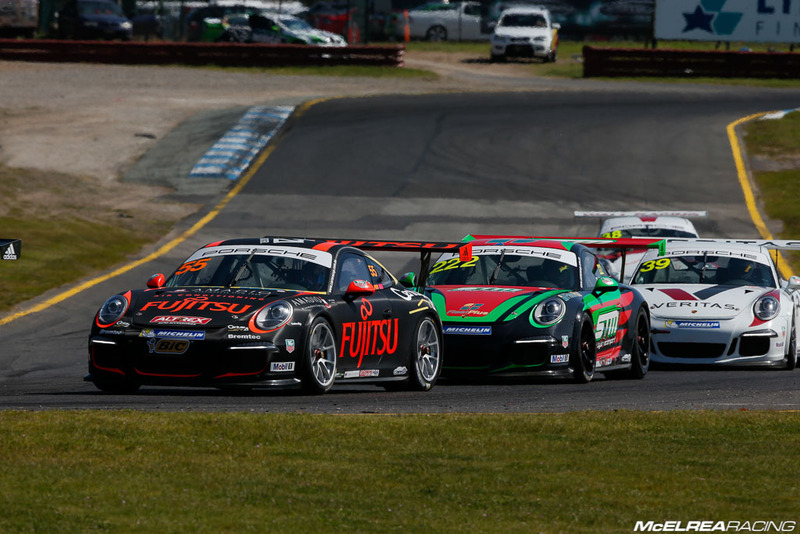 He drove two very focused and faultless races to record his best result in the new 991 Cup Cars. This was Shae’s first podium finish for 2014 and it was a great reward for both Shae and his crew who have been working their butts off all season..!! The next task is to get Shae on the podium at Bathurst..!! Shae Davies didn't put a foot wrong all weekend to finish second outright for the round..!! ‘Princess’ qualified 14th (11th in Pro) in the 24 car field. Renee’s first race was upset by an average start and being held up by cars she was quicker than. She then got caught-out by some slower cars dicing for position in front of her which forced her to lock her tyres causing her to tag Roger Lago and turn him around. This resulted in her first drive through penalty in Carrera Cup. Princess got her Fujitsu car off the line better in race 3 which lead to a very energetic race in which she started 21st and finished 12th. Her pace over the weekend was very impressive being only 1.6 seconds off Luffy on Pole and then the same gap behind ex MR Driver Michael Patrizi who was the winner of race 3. This proves her genuine progress from even a few months ago..!! Princess got a great start in race 3 and after starting from 21st drove a mature race to finish 12th. Tony qualified well to finish 15th outright and 4th in Elite class only 4 tenths behind Elite pole sitter and former team-mate Tony Bates. Wallsy drove very well and finished 14th outright and 4th in Elite in the first race. He was very upset with the behavior of his Elite class colleagues in race 3 resulting in a spin which dropped him down the order for a 10th place finish. Tony Walls qualified 4th in Elite Class only 4 tenths behind the Elite pole sitter. 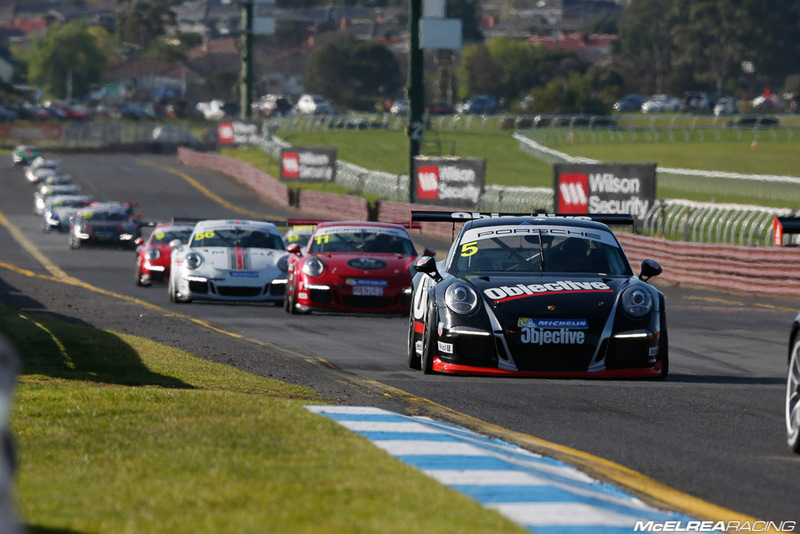 Scotty qualified 13th in Elite class in the largest Carrera Cup field since 2006. 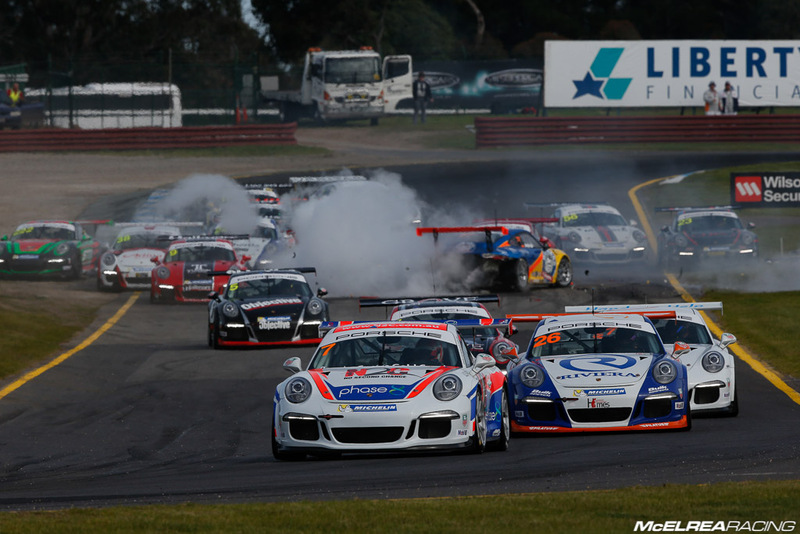 He had an eventful first race with a few quick looks at the scenery surrounding the picturesque Sandown Raceway eventually succumbing to a shredded drive belt. In race 3 he delivered a typically robust drive resulting in a 19th outright and 11th in Elite. 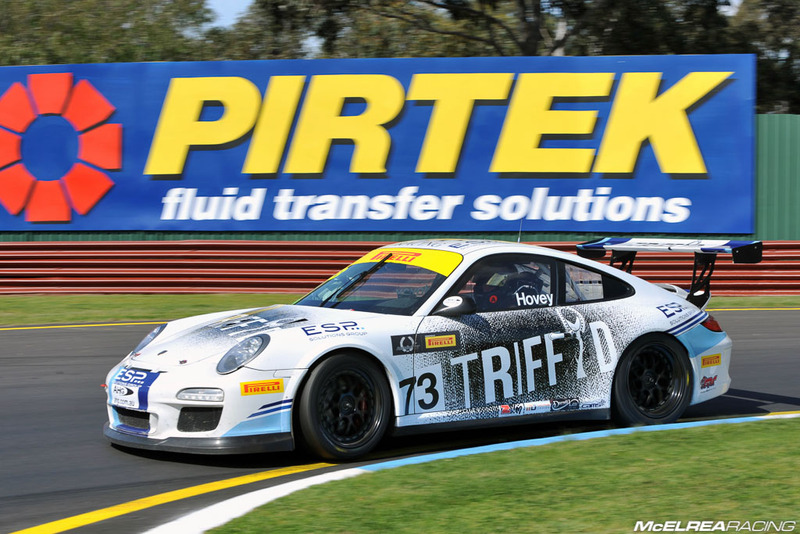 Scotty heads off to Phillip Island this weekend to do battle in the final round of GT3 Cup Challenge Championship in his 2011 model Cup car. After such a great performance at Eastern Creek, ‘Hoves’ decided to give a very grateful Matt Campbell another call-up at Sandown. Once again they were competing in the ‘Trophy Class’ against some far more exotic and faster machinery. Matt qualified car 73 in an amazing 4th in Trophy Class. Once again they made a great team and embarrassed some far more fancied machinery to finish 5th in Race 1, 3rd in Race 2 and 5th in Race 3. Michael and Matt’s pace along with the reliability of the Triffid Porsche saw them finishing an amazing 11th Outright and 3rd in Class. Hovey and Cambell finished an amazing 3rd outright in a field of far more fancied machinery..!! 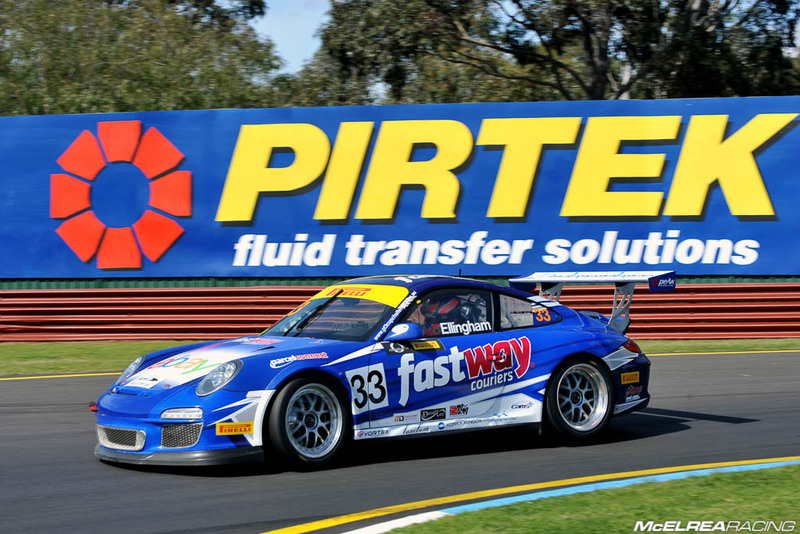 Simon was back in the Fastway Couriers car for the first time since Eastern Creek. This was also his first visit to the legendary Sandown Raceway so we had him on a very steep learning curve for the weekend. He did a good job in Race 1 finishing 7th in Trophy Class, and was heading for a Top 5 finish in Race 2 when he was hit from behind in the closing laps of the 31 lap race putting him into the wall for a very unfair DNF. In Race 3 he finished a very solid 15th Outright and 7th in Trophy Class. It is rewarding to see Simon’s impressive improvements. 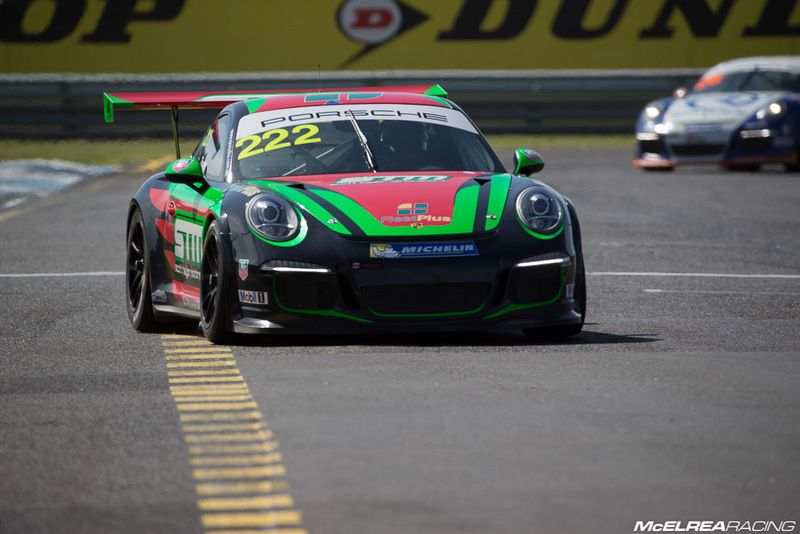 Simon will contest the final round of the GT3 Cup Challenge Championship at Phillip Island this weekend along with his team-mate Scott Taylor. It was rewarding for the MR crew to see Simon’s impressive improvements at Sandown..!! With both Carrera Cup and Australian GT podiums (along with a Carrera Cup pole) we have plenty to be proud about from Sandown. Shae Davies finally got the podium he has been threatening since the first round at Clipsal back in March. His pace was outstanding and he didn’t but a foot wrong all weekend. It was great to show our pace with Luffy’s 3rd pole (MR’s 4th) of the season, but disappointing that his qualifying pace only delivered two 5th places. This goes to show how much pressure the V8 co-drivers are under these days and how competitive the Carrera Cup field is. With Steven Richards’ mechanical DNF in race 3 Luffy is now back in the lead of the Championship but there is still allot of work to do over the remaining 6 races of what is turning out to be the most competitive Carrera Cup Championship in recent history. In the Australian GT Hoves got his second ‘Trophy Class’ podium at Sandown and as a result is sitting 3rd in the Championship ahead of the last race at Highlands Park in NZ in November where his team-mate Simon Ellingham will be joined by DVS driver and fellow Kiwi Andre Heimgartner. 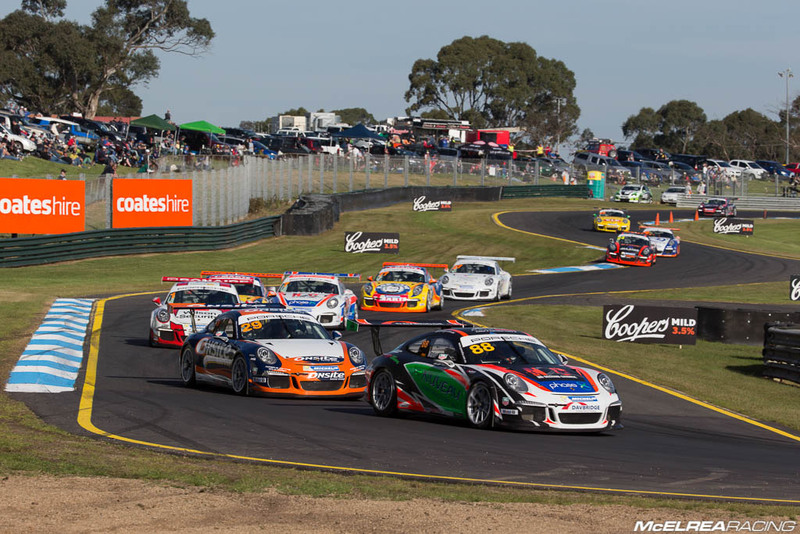 Thanks to all of our partners and supporters for keeping in touch and following our journey so far in the 2014 Carrera Cup and AGT Championships..! !